Home World Horse Racing News Can Niigon’s Eclipse defend her Victoriana Stakes win at Woodbine? 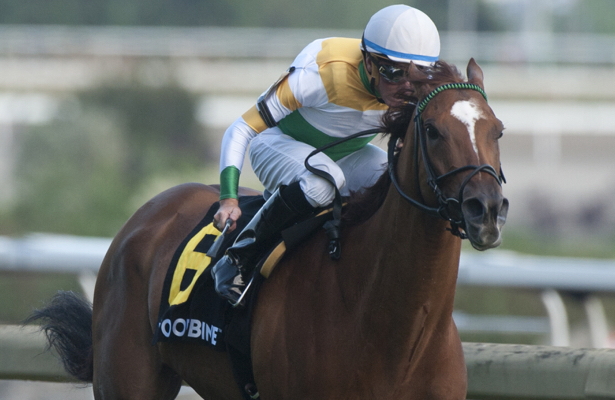 Can Niigon’s Eclipse defend her Victoriana Stakes win at Woodbine? Chiefswood Stable’s homebred mare Niigon’s Eclipse will attempt to add another Victoriana Stakes victory to her credentials during Woodbine’s special holiday Monday program. Niigon’s Eclipse headlines a field of seven Ontario-sired fillies and mares set to contest this year’s 1-1/16 mile event on the E.P. Taylor Turf Course. The defending champion, who wintered in Florida and ran a huge prep race at Keeneland on her journey back home for the Woodbine meet, has since collected a Grade 2 stakes win over one mile on the turf in the Nassau. She followed up that late-May victory finishing second in the seven-furlong Zadracarta on Canada Day. “This filly is a picture of consistency,” said trainer Rachel Halden. “Seven-eighths isn’t quite her ideal distance, but on that day [in the Zadracarta], she actually kind of got squeezed at the break and was a lot further out of it than normal. She closed a lot of ground and it was a very good effort. The five-year-old Niigon-Eclipse Bay mare, who is a five-time winner, has hit the board in 14 of her 17 career starts to earn more than $440,000 in purses. Gary Boulanger, who was aboard for her last two stakes races, will retain the mount. Zadracarta winner Silent Sonet will be looking for back-to-back stakes wins in her four-year-old campaign for trainer Nick Gonzalez and owner Ivan Dalos while Crumlin Queen heads into the Victoriana just a head short of a perfect season in three starts racing on the main track for trainer/co-owner Michael Doyle. A three-time winner of this stakes event, Doyle trained Avenare to one of that mare’s Victorianavictories in 1980 in addition to Lady Ice in 1984 and Majority in 1989. Kevin Pasher’s Miss Sea gave way to finish fourth in last year’s Victoriana and will try again coming off a June 29 victory over the same course and distance for trainer Michael Keogh. Other stakes-placed mares in the field include Red Cabernet and Sugar Jones while Adopted Family will be making her debut in an added-money event.